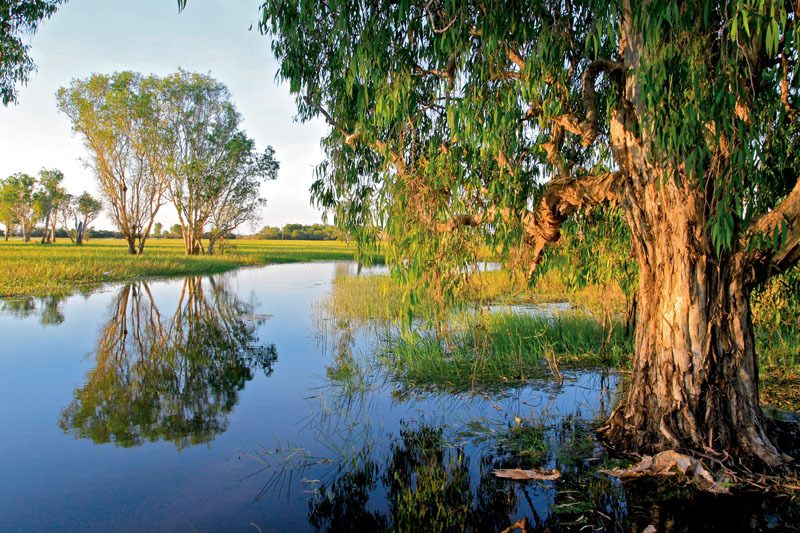 A visit to The Northern Territory wouldn’t be complete without spending some time in the spectacular World Heritage listed Kakadu National Park. Australia’s largest national park is home to a third of the bird species found on the continent, a quarter of our freshwater fish species, and an astounding (and terrifying) number of crocodiles. 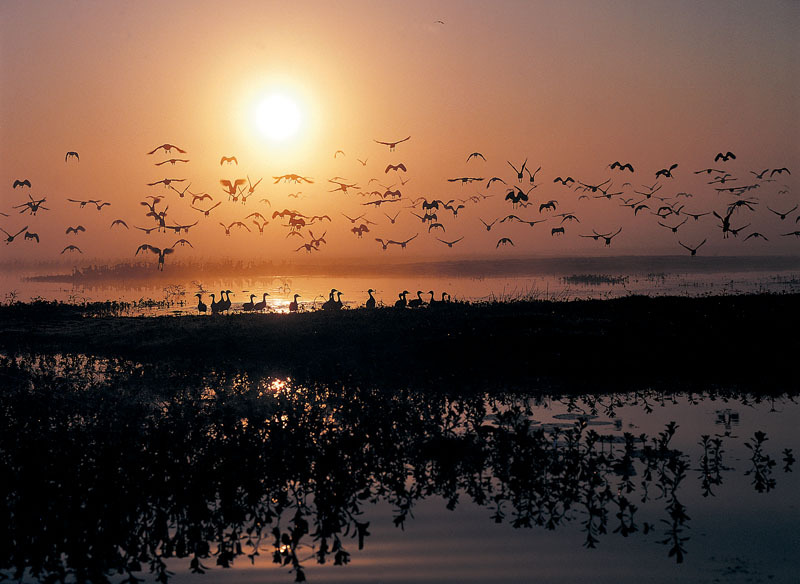 In terms of the volume of wildlife present it is akin to the wonders of the African savannah. We began our Kakadu adventure from the south, travelling from Katherine to Pine Creek and finally entering Kakadu National Park. Being a typical camper trailer family, we were keen to get off the tar and explore some of the more challenging drives. We spent our first night at Gunlom (pronounced goon-lom), the southernmost campground. The access road is open to 2WDs for most of the year — but I don’t know whether they arrive in one piece. The corrugations and wash outs were impressive. The camp ground was perfect for camper trailers — with flat grassed sites, hot showers, flushing toilets, water onsite, picnic tables and fireplaces. Plenty of trees provide shade, and most days the rangers give informative talks about the area. Thankfully there was a separate area for people with generators. The plunge pool at the base of the Gunlom waterfall is spectacular, and the ranger informed us upon arrival that it was safe for swimming — so no saltwater crocs. But, they can never be sure! As inviting as this was, the one kilometre walk to the top of the waterfall beckoned. 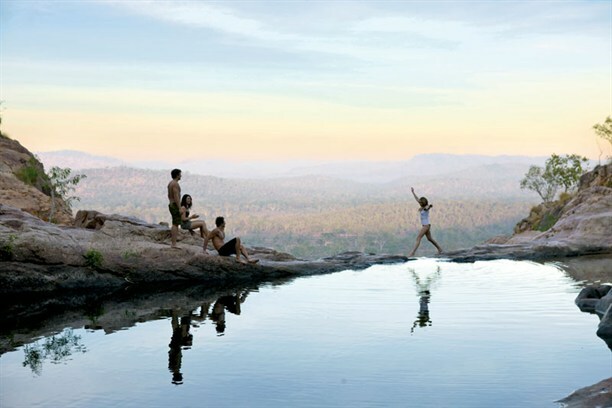 The track winds its way up the side of the mountain and is very steep; it meanders along the edge of the cliff face and turns towards a secluded series of picturesque swimming holes. Small clear waterfalls cascade between each pool before disappearing over the edge and down the main waterfall. This is an amazing spot for photographs, sitting in the crystal clear water, overlooking what could very well be the edge of the world. We had to drag the children away because we only had one week to explore the region, and it was time to go. 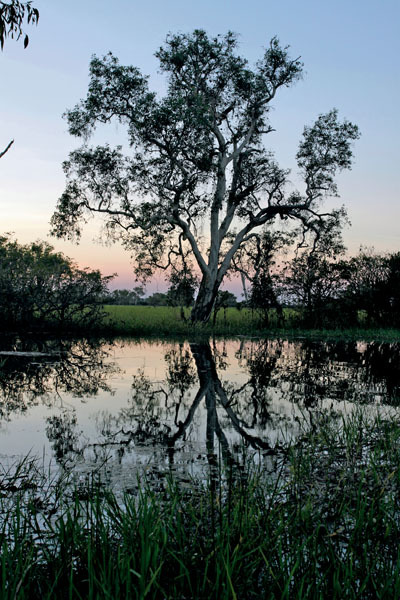 Our next stop was Mardugal Camp Ground, the closest camping spot to the popular Yellow Waters Billabong. Billabong cruises depart every two hours from dawn till dusk, but I reckon the sunset cruise is the best! Our tour guide, David, was full of zoological knowledge and had an intense passion for Kakadu and its natural inhabitants. His detailed explanation of the way the local Bininj women catch file snakes and the purpose of a crocodile’s spines (which act as built in solar panels) brought the trip to life. The huge amount and vast variety of wildlife was amazing — we got close up views of jabiru, brolga, kingfishers, egrets, night herons, sea eagles, whistling ducks, wild horses, feral pigs, saltwater crocodiles and much, much more. We enjoyed an unrestricted view of sunset over the wetlands before heading back to the wharf. The cruise was more expensive than we would normally be willing to shell out, but it was well worth it. The Yellow Waters boardwalk doesn’t cost a cent and also gives you a close up look at the billabong. There was a tense moment when we returned to the carpark, after lingering on the wetlands boardwalk, and found ourselves between a herd of wild horses and their aggressive stallion — I didn’t know my kids could run so fast! We then visited the Warradjan Cultural Centre which tells the history and culture of the local Aboriginal people — the Bininj. We learnt how they collect, prepare and cook their food; and how the women collect, dye and weave pandanus leaves into baskets. The centre was very informative, and enjoyed by all. We had been warned that the 50km road to Jim Jim and Twin Falls was very rough and would take over two hours to navigate. Whilst we encountered numerous corrugations, the dirt road into the camp ground was one of the best in the park. Garnamarr Campground is well serviced with hot showers, flushing toilets, water and plenty of space. Greg, the onsite caretaker, was waving down every vehicle informing them they needed a snorkel to tackle the drive to Twin Falls, as well as prohibiting the towing of trailers from hereon. I began to get excited, while my wife blanched. 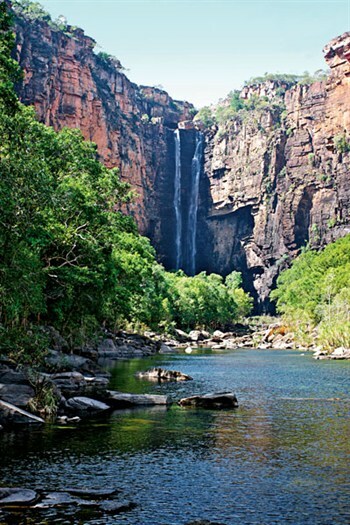 The next day we set off for Twin Falls and Jim Jim Falls, two of the most coveted destinations in Kakadu. We were surprised to see signage boldly stating ‘lock your hubs and engage 4WD now’. The 10km road from Garnamarr to Jim Jim Falls was extremely rough; with plenty of water, sand, washouts and mud to negotiate. It took about 30 minutes to complete. Just around the bend, the infamous Jim Jim Creek crossing was running about 60cm deep, but the concrete causeway gave us little trouble. The next eight kilometres to Twin Falls took about 20 minutes. The road was little more than wheel ruts in the landscape. Oncoming vehicles posed a challenge, and gave the opportunity for some bush-bashing. But the effort was well worth it. People used to li-lo or swim down the river, until a tourist was bitten by a saltie — so we just took the cruise. We then walked the relatively easy track through the gorge and onto the beach beside the falls. Due to the late and huge wet season there was still water taking the plunge off the cliff face and into the sparkling pool at the bottom. Back at Jim Jim Falls we negotiated the single lane walking track. The lookout is only 400m away and reasonably easy going. However, the next 500m to the base of the falls had us crawling over rocks, ducking under trees and jumping across boulders — more a scramble than a walk. The small waterfalls trickle over 150m down a sheer cliff, and land as a gentle mist in the 70m deep plunge pool below. It is a remarkable sight, and inspired us to take a quick dip to cool down from the strenuous walk. A quick dip was all we could handle — the water doesn’t get any sunlight until October, and it was freezing. 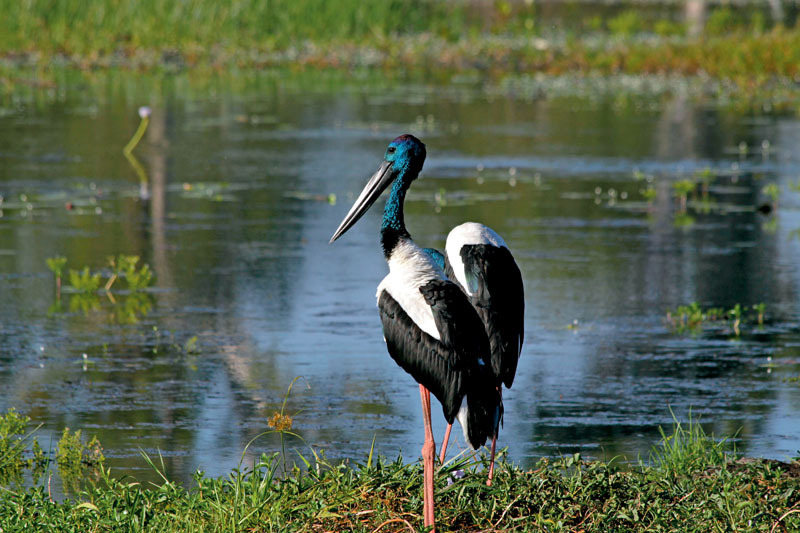 Merl campground is at Kakadu’s northern end: 42km from Jabiru. On the way we stopped at Nourlangie Rock to check out the aboriginal rock art. 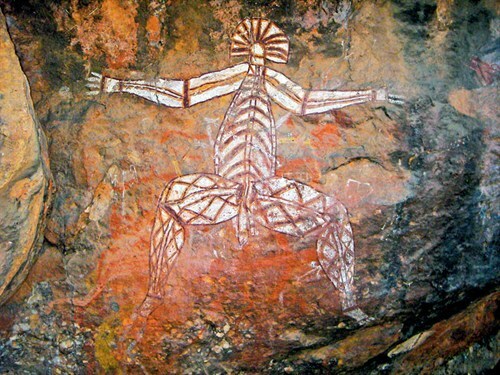 In all, there are over 5000 rock art sites throughout Kakadu. Some paintings date back thousands of years — often new artworks have been painted over the older creations. Visiting the art was an excellent opportunity for our home schooled children to complete an assignment, bringing their social studies to life. Our last stop was Ubirr; to tour more rock art sites, and to watch the sunset over the Kakadu wetland. As the sun went down on our Kakadu adventure I asked the children about their favourite bit of the past few days: “swimming at the top of Gunlom Falls”, “awesome, awesome, awesome”, “swimmin’ at Jim Jim”, “the billabong cruise”, and “being charged by a stallion at sunset” were their responses. As I reflect, I am delightfully surprised at how family friendly the park is — children under 16 travel free in Kakadu! It was refreshing to purchase a National Parks Pass and pay camping fees for the adults only. The Yellow Waters Cruise was the only time we paid for the kids. 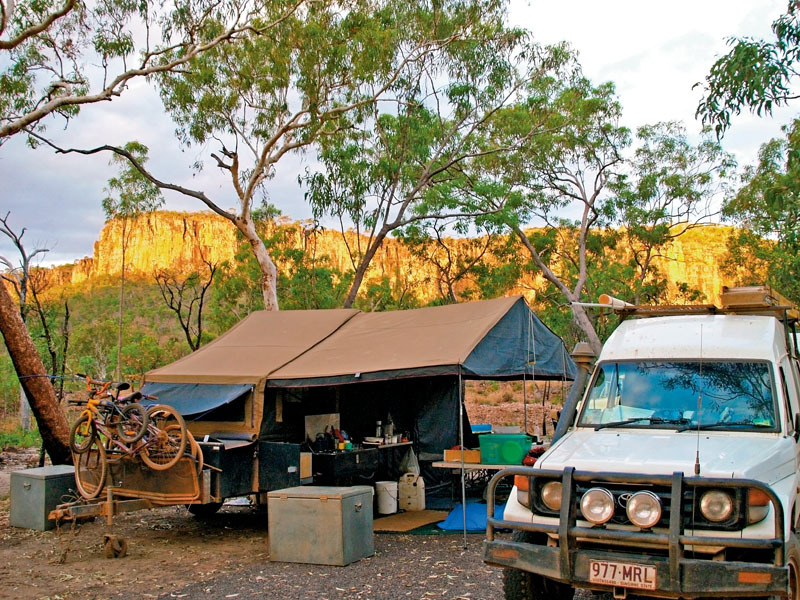 For bitumen road travellers, who prefer first class accommodation; for the more adventurous who like dirt roads and a good campsite; for outdoorsy lunatics who like extreme 4WDing, and sleeping under the stars — Kakadu has something for you all. 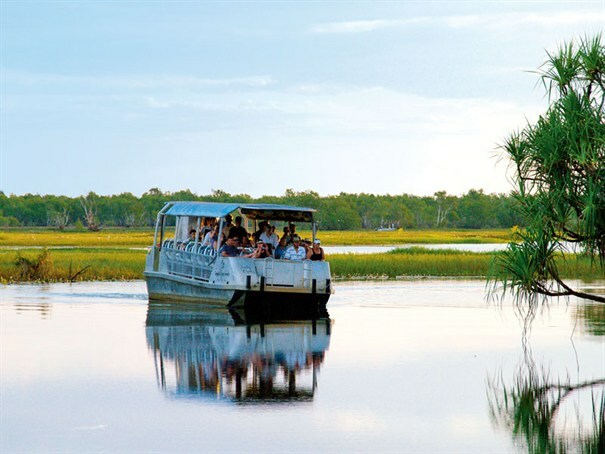 Find and book holiday park accommodation near Kakadu National Park.